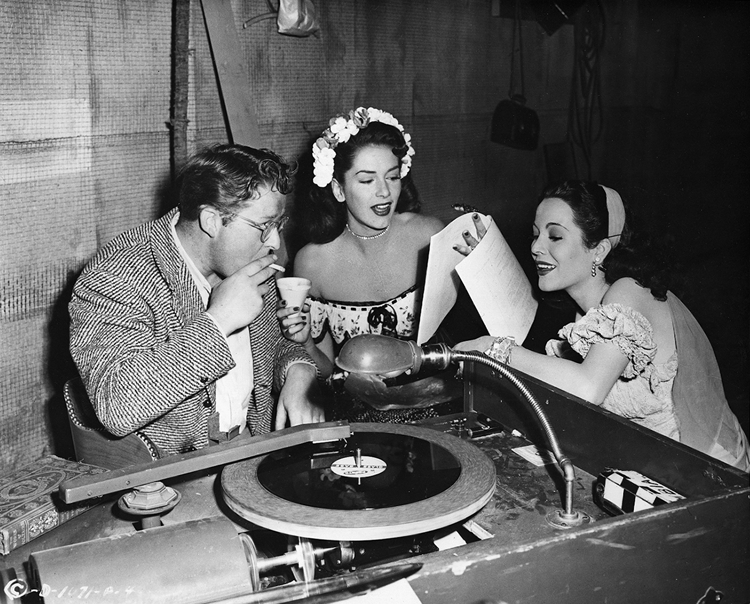 LEARNING LYRICS … Jinx Falkenburg and Isabelita rehearse their musical numbers for a scene in Columbia’s new musical romance, “The Gay Senorita.” Truck Krone, of the studio sound department, keeps the music going. Isabelita, also known as Isabelita Y Miguel, is Lita Baron, born in Almeria, Spain in 1929. Truck Krone is listed at IMDb as working primarily in the Camera and Electrical Department, not the Sound Department. Photo by William E Thomas.